In one of our previous articles we focused on our highly affordable entry-level monthly plans for small businesses, but this time we are going to the completely opposite end and show what Pro Rank Tracker can do for the bigger fish – because big businesses need reliable rank tracking solutions more than ever! You might be thinking, well how is this even relevant for me? I barely hit a few hundred terms in my SEO needs… how can I possibly benefit from the high-end monthly plans? Well, stay tuned and read through, because there might be a nice passive income bonus to your monthly income by the end of this article that can potentially happen for you here. Needless to say, if you are part of a big SEO agency or e-commerce company, then this article will be especially relevant for you. Believe it or not, there are 3 secret monthly plans we don’t openly advertise on our monthly plan page. 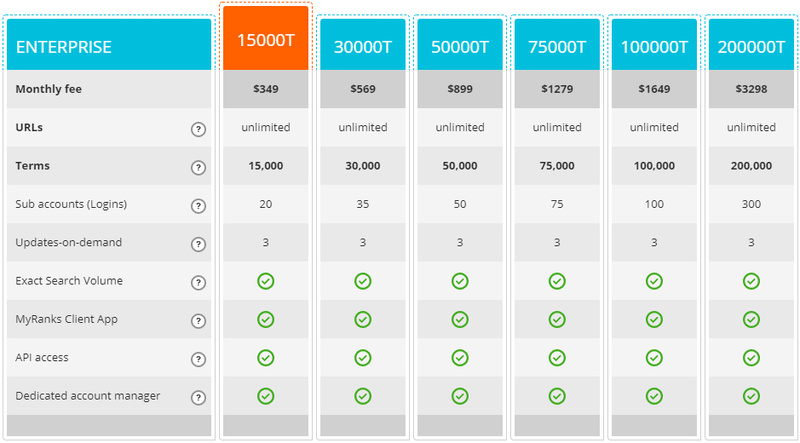 These 3 types of plans are so extreme in their features and the quotas that they offer that they’re only accessible to some of our paid monthly users. But for this special article we decided to make an exception and openly talk about them, and as we said, you’re about to see why it matters even if you’re a small business. These are the highest rank tracking quotas currently available on the market with by far the lowest price. Our highest quota also comes at the lowest price of just $0.016 per tracked term. This is absolutely unrivaled and it is easy to do some research and verify this claim (which we encourage you to do). Migrating to Pro Rank Tracker is easy since we have a bulk upload feature, which can transfer entire portfolios of ranking data with a single file. And in any case, each enterprise-level user gets their own dedicated account manager who will make sure the migration process is done smoothly and effortlessly. These birds are migrating to a warmer climate where they can breed, have more accurate rank tracking with PRT, and continue the cycle of life. 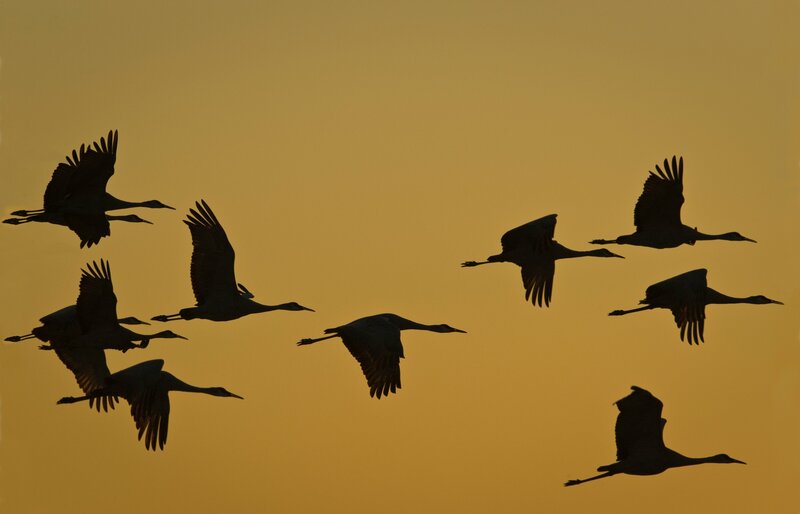 Some estimate they are able to migrate using Earth’s magnetic fields with a help of some quantum mechanics. The most advanced API access is also included, in case the user already has their own SEO tool and just needs high-quality rank tracking streamed directly from the source to their tool. Setting up the API comes with full documentation and a dedicated API specialist who will help with any issues and questions. Now for the best part – while the huge quotas above might not be relevant in your case, chances are good you know someone who can benefit from it. This is where our Affiliate Program comes into play. If you refer someone to us who purchases an account package, you will enjoy a 20% monthly commission for the entire duration of the referred account! Just give us the lead or connection, and we will do the rest. In fact, our tech will speak for itself, and from our experience, once people see the difference between PRT and others, they choose to trust their rank tracking to us. At these levels, a 20% commission can potentially amount to thousands of dollars a year of passive income from just a SINGLE referred account. And that’s no joke. You will be doing a service for yourself, for us, and most importantly for the business that will get to try us out. There is a big problem on the market – search engines, and Google in particular, have become extremely advanced and personalized, but the rank-tracking technology most encounter on the market seems to have staggered and stopped developing somewhere back in 2015. Inaccuracy, outdated ranking methods and inflated prices plague the market. And when a business becomes big enough to require the huge quotas we will discuss here, high-quality rank tracking becomes critical, considering everything that is at stake for them. Big businesses are STARVING for a real, high-quality tool that will deliver 2018-2019 results, not outdated 3-year-old ranking methods. Improper rank tracking can influence huge SEO campaigns, blur the real ranking progress and end up unnecessarily costing thousands of dollars! The trouble is, many are simply not aware of boutique solutions such as yours truly, and they opt to stay with another tool they chose when they were a smaller business because that what was available to them at the time. Many tools might parade the fact that they can track and differentiate between mobile and desktop Google ranks, and that’s great if we’re still living in a time where iPhone 6 is the next big thing and Jeff Bezos is just an unimpressive 11 figures into his net worth. But the thing is, Google didn’t stop developing in 2016. On the contrary – they made some huge personalization leaps that only Pro Rank Tracker can correctly track currently. Why it matters for big businesses – If a small business that operates in a small niche loses their iOS visibility, it might cost them a few hundreds of visitors. But, if a huge business in a huge niche loses iOS visibility, it can potentially cost thousands of potential daily visitors. Real local rank tracking on Google is more than just rank tracking by country! When a rank tracker says they can show you specific country ranks, that might sound impressive. The trouble is, a country rank doesn’t really exist (not since 2017 anyway). Google geo-targets a user’s exact location, and their targeting is so accurate and advanced that users from adjacent neighborhood will most likely see different search results (and therefore different ranks) for the same keyword! So what does “country-level rank tracking” actually show you? For the most part, it shows you the ranks most people from that entire area see. It’s a very unreliable way to know regional progress for high-end use cases. Pro Rank Tracker is the only rank tracker on the market that can reliably track exact geo-targeted locations from all over the world, down to specific ranks people who search Google inside an airport see! Why it matters for big businesses – A global brand needs to know how they are doing on search engines in specific areas all over the country. They need more than estimated regional ranks that don’t correspond to their target audiences. A huge e-commerce website might be missing potential buyers if for instance they are ranked lower in LA than in NY. Accuracy for rank trackers is simply abysmal in some cases. If the rank tracker is inaccurate in addition to being able to track only country-level ranks, you might see a rank that’s off by a few tens of positions from its actual position in the search index! Google is updating ALL THE TIME, not just in the major updates we hear about. Accuracy simply means monitoring ALL of Google’s micro changes that happen all the time, and not just updating the system following an advertised update. Pro Rank Tracker’s constant monitoring and fast response mechanisms make sure that we virtually always read Google’s search index precisely the way it is. Why it matters for big businesses – Huge businesses invest tens of thousands of dollars a month on SEO. SEO agencies that send ranking reports to their big clients need to show results. Showing a client that he is really positioned no.5 vs. no.10 can make a huge difference at those levels. Websites that have huge active SEO campaigns going update their content frequently, be it with adding written content in their blog of in the form of news, or by adding and refreshing their e-commerce stock. Google crawls such websites very frequently and updates their ranks accordingly. In fact, Google crawls and updates rankings to these websites as much as every few seconds! Most SERP trackers on the market can’t check your ranking data more than once a day, and some only update it once a week. The reason is that checking ranks takes the most system resources, so by cutting corners on ranking data updates, rank tracking tools can save on resources and costs. Pro Rank Tracker updates ranks at least once a day and up to additional 3 times on demand – not because we are so loose in our spending, but because our algorithms are more efficient and don’t require the same amounts of recourses as others. Why it matters for big businesses – Viral trends can send ranks skyrocketing inside a window of hours to minutes. 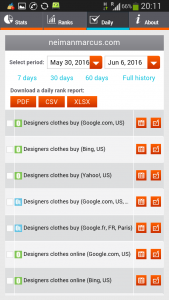 It is in those critical moments you need to get updated ranking data as soon as possible to stay in the loop. On the opposite end – major Google updates can send rankings crashing unexpectedly, costing businesses a small fortune. Knowing the ranking consequences of a Google update as soon as it happens is also crucial. 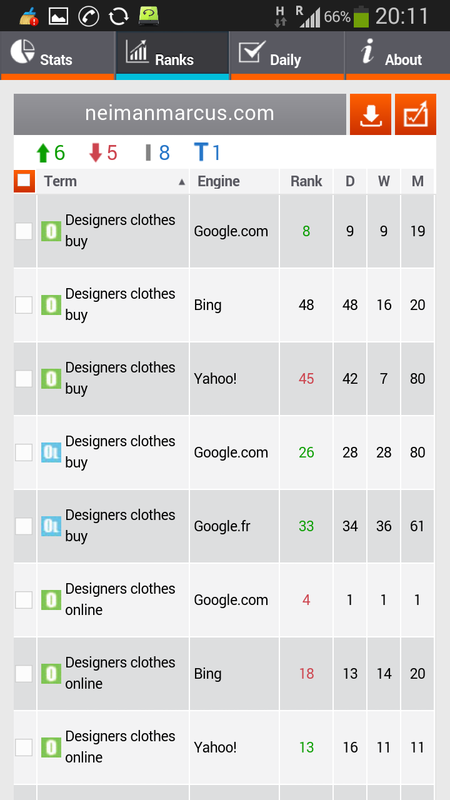 All SERP trackers offer Google rank tracking since it is the main target of most SEO campaigns (as outdated as that tracking may be), and some offer Bing and Yahoo! as well, but no one else can handle what we offer. Other than Google we can also track with 100% accuracy: Bing (all international versions), Yahoo! (all international versions), Amazon (all international versions), YouTube, and Yandex (.ru and .com). Why it matters for big businesses – SEO agencies, especially known and established ones, get many types of clients, and it can be time and money consuming to use several SERP trackers when they can use just one. They effectively can be covered for all of the main SEO targeted search engines in a single all encompassing tool. Many big e-commerce websites sell their products on Amazon as well and can benefit from knowing their Google ranks alongside their Amazon ranks. Key advantages: 5 SERP trackers in ONE. 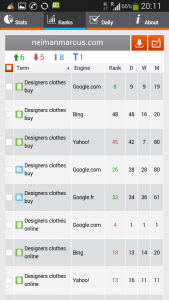 Some SERP trackers on the market can place your logo on top of the ranking reports that you generate. Others don’t offer even that. 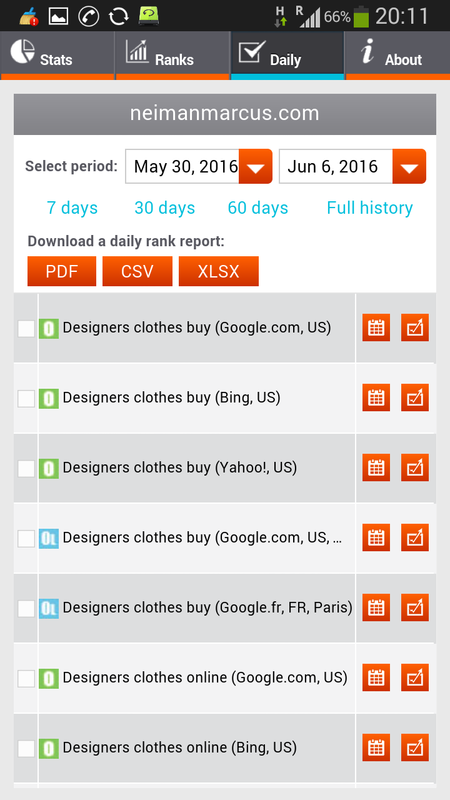 Shared reports – a special LIVE online ranking report that can be hosted on the user’s domain and of course feature their logo and company details. This page can be encrypted with a password and set with an expiration date. Here’s a sample for you to experience yourself (password is “shared”). 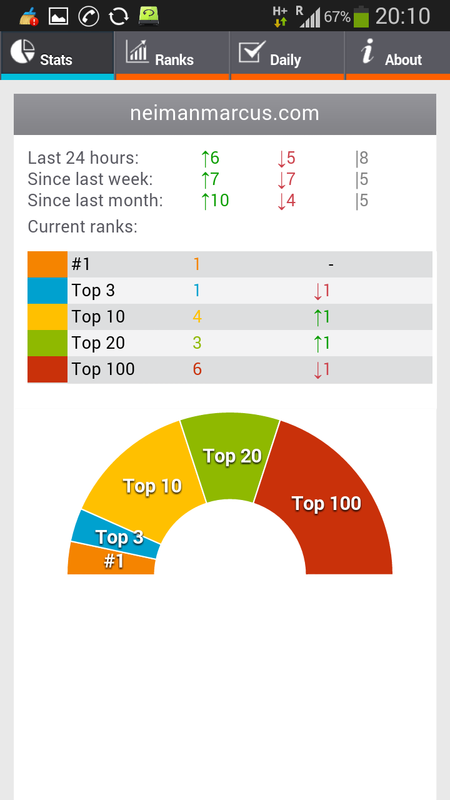 MyRanks – a mobile app that your clients can download that shows their live ranking data. 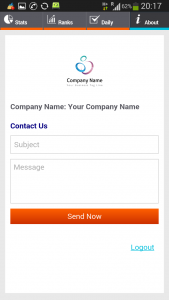 Set up a unique user name and password and embellish it with your logo. 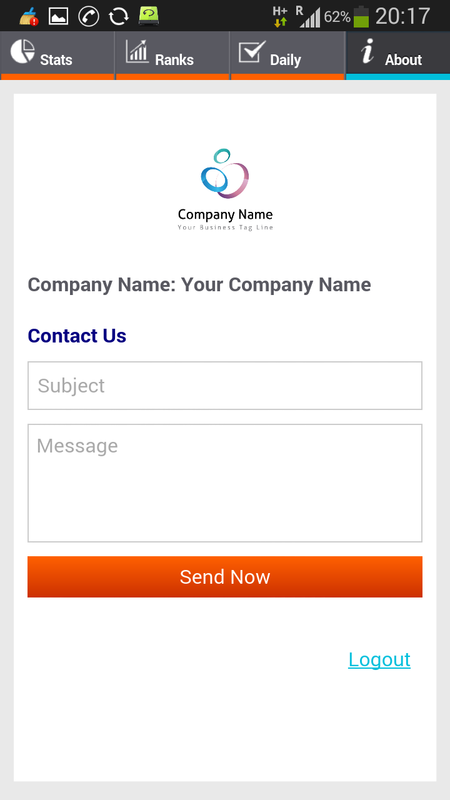 A dedicated “About” tab will show your contact details. In fact, if you use our sub-accounts feature, our entire SERP tracker can be white labeled and our logo replaced with yours. Why it matters for big businesses – At the higher levels, brand preservation becomes a key element of the overall marketing strategy. A recognized brand signifies stability and experience, which matter to consumers. Preferably the company’s logo needs to be featured consistently on all auxiliary documents, and that includes ranking reports and everything that has to do with the rank tracker. Key advantages: Pro Rank Tracker is backstage. The brand of the user takes center stage and is showcased on ALL reports and features. How can a boutique SERP tracker such as Pro Rank Tracker be ahead of everyone else? Simple – we chose to focus on developing our tech and customer service instead of marketing. Also, we work smart – not only hard – to improve our tech, and our R&D team is filled with the sharpest and most talented programmers on the market. It is for these reasons we grew to have more than 60k users almost exclusively through good old word-of-mouth. This might seem like a modest user base in comparison to some of the big players, but don’t confuse it with lack of experience. We’ve been in this game for more than 5 years, constantly evolving and developing our tool under the radar. Our experience of handling huge clients with huge quotas is notable. Some of our users are huge brands and companies that chose us after going through many other SERP trackers. We make sure we’re one step ahead of the search engine arms race and always give our users the most advanced rank tracking technology, spearheading unique rank tracking types that are the wave of the future. We hope now you have all the information you need to successfully recommend Pro Rank Tracker to users that might need high-quality SERP tracking by 2018’s industry standards. If you need any other information or have any questions about the whole affiliate process, don’t hesitate to ask us in the chat. You’ll talk to our human reps and not cheap bots that waste your time and give no useful responses. And if you’re not our user yet and you’ve read through this article, don’t think we’ve neglected small businesses. Far from it! We offer the only entry-level monthly plans on the market for the most affordable prices, starting from our most basic $17 Bronze Plan. We love letting our tech speak for itself! We employ no auto-renewal traps and we DON’T believe in charging grey fees, no matter the size of our users or how much they pay. To prove our case – we don’t ask for credit card info to start our 7-day FREE trial with all features unlocked. Small or big, once your trial is over you will simply be moved to our regular free monthly plan that has no time limit. We believe that you join because you will see the value and not because you forgot to cancel your free trial.